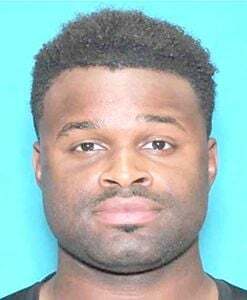 Baytown police and the Harris County District Attorney’s Office are looking for a Baytown man who was charged with money laundering in an investigation that started with a California company reporting fraud to the Los Angeles County Sheriff’s Office. He first came to the attention of California authorities when a business reported it had paid nearly $20,000 as a deposit for 60 tons of chicken feet that were never delivered. Investigators determined the deposit payment was wired to a bank account at the Bank of America on Garth Road. The name on the account was “Tyson Food International,” but it had no connection to the large food company with a similar name. A press release from the Harris County District Attorney’s Office and a criminal complaint filed with the 262nd District Court in Houston proved more details. Baytown police were then contacted, and they determined that the local “Tyson Food International” was allegedly a catering service with an address at an apartment complex on Ward Road— an address associated with Jones. Baytown Police confirmed through bank records the defendant indeed received the $19,800 paid by the California company and withdrew all funds from the account within a week of the wire transaction. In reviewing the account, police found payments from three additional sources: two 65-year-old women and a 67-year-old woman. One of the 65-year-old women told police she is a cancer patient who fell in love with a man online who coerced her into depositing money into his bank account--the same bank account associated with the California case. The other 65-year-old woman said she was contacted online about an investment. The third woman declined to discuss the matter with police, according to the criminal complaint. The three women reported a combined loss of $211,653. When officers attempted to interview Jones again, he stopped cooperating and could not be located. Dorris said, “Baytown detectives, with the assistance of the Harris County District Attorney’s Office, worked tirelessly on this extremely complex and far-reaching investigation over the course of several months. “Cyber/Financial crimes such as these are becoming more and more complex every day and require a great deal of collaboration between police and prosecutors to ensure a successful investigation and prosecution. Anyone with information is asked to call Baytown Crime Stoppers at 281-427-TIPS (8477) or Houston Crime Stoppers at 713-222-TIPS (8477).